Gas-powered buses which leave nothing behind them but a cloud of water vapour start running in London on Wednesday. Three hydrogen buses begin a two-year trial on Route 25 from Oxford Circus to Ilford, east London. 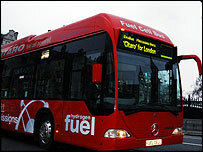 Mayor Ken Livingstone said the £750,000 buses were the "greenest, cleanest and quietest ever". London is one of nine European cities taking part in the trial as part of a scheme to reduce greenhouse gas emissions and noise pollution. The route, which takes in both the West End and the East End, was chosen because it is long and has different traffic conditions. Mike Weston, from Transport for London, said: "For the first few months they will be running as extras on the normal Route 25 service, so they are providing extra capacity. "After the first few months we intend to integrate them into some other routes, once we know they have proven reliable on a day-to-day basis." The single-decker buses use fuel cell technology to power an electrical engine and can run for 125 miles before refuelling. The liquid hydrogen is delivered to a fuelling site where it is dispensed as a gas into pressurised cylinders. These cylinders are placed on top of the bus with the fuel-cell system and coolers. The only emission is water, which forms into a vapour cloud as it leaves the exhaust. It could be a decade before the fuel cell technology is cheap enough to replace diesel. "The only emission is steam which is so pure you could distil it and drink it."